The Colts returned to the Indiana Farm Bureau Football Center on Monday to kickoff their nine-week offseason program. Like the first day of school, many Colts were eager to get back with their teammates. Feels good to be back in Indy and working with the team again! 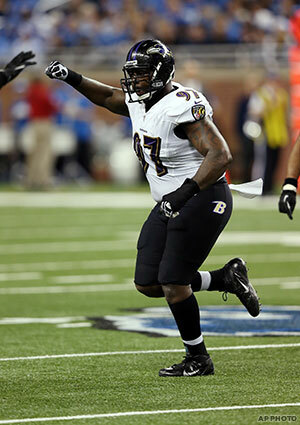 The Indianapolis Colts today agreed to terms with unrestricted free agent defensive end Arthur Jones. Jones, 6-3, 315 pounds, totaled 118 tackles (66 solo), 8.5 sacks and one forced fumble in 46 career games (20 starts) for the Baltimore Ravens over the past four seasons. In six postseason games (two starts), he recorded 10 tackles (five solo), 1.0 sack and two fumble recoveries. In 2013, Jones started a career-high 13 games and registered a career-high 53 tackles (27 solo) and 4.0 sacks. He was part of a defense that ranked fourth in the AFC in rushing yards allowed and sixth in total yards allowed. In 2012, he played in all 16 games (six starts) for the first time in his career and tallied 47 tackles (27 solo), a career-high 4.5 sacks and one forced fumble. He set a personal best with 2.0 sacks in Week 12 at San Diego and recorded 1.5 sacks two weeks later at Washington in Week 14. In the Ravens’ Super Bowl XLVII victory over the San Francisco 49ers, Jones contributed with two solo tackles, 1.0 sack and one fumble recovery. 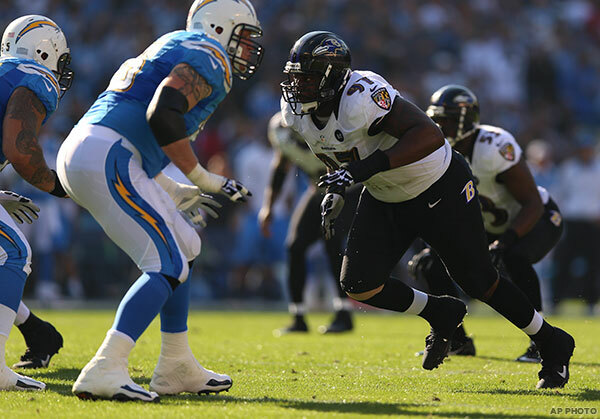 Jones was originally selected by the Ravens in the fifth round (157th overall) of the 2010 NFL Draft out of Syracuse. He started 32-of-44 games for the Orange and totaled 145 tackles (85 solo), 38.5 tackles for loss, 6.5 sacks and four fumble recoveries. His 38.5 tackles for loss are the most in Syracuse history by an interior defensive lineman and rank third on the school’s overall career record list. As a junior in 2008, Jones earned All-Big East First Team honors after tallying 60 tackles (33 solo), 3.5 sacks and 13 tackles for loss, which ranked sixth in the conference.